In the 21st century as in the 8th and 9th, nothing ever stands still. Wikipedia is a wonderful resource, as are online libraries of the world’s historical texts, but there are no narratives linking different articles together. This book is one such narrative, drawing on many other publications and online digital resources such as the ones available to us from Project Gutenberg and Sacred Texts online. This publication is published as an eTEXT book (more than just an eBook) intended for the mobile-digital audience using the benefits of hyperlinking. For the ancient Scandinavians, death was part of life: In many ways, it was a society based on a system of belief concerning the dead and the gods who ruled the realms between which man passed in life and death. For the late iron-age people of Scandinavia – well before, in fact Viking times – the folk of the land believed each tree, each rock had a spirit attached to it and that when dead, life passed back to the land from where it came from. In Viking times, burial sites of ancestor worship often featured the device of the boat carrying the dead to the halls of Valhalla. Of this we can only speculate, since the sagas that have come down to us, mostly from Icelandic sources, are only fragmentary. Scholars do not have any answers to the question whether the dead would remain for some time in the grave and later depart for the realm of the dead, what the purpose of the grave goods was, or if ‘the ship in the barrow’ was to transport the deceased to the realm of the dead. The Norse were driven by their beliefs, they conditioned what they thought and what they did. For the Norse, the concept of the afterlife was a very real part of the lives of people for whom superstition was a way of life. In this first volume of Viking Legends and Norse Mythology, The Underworld and the Afterlife, I examine the key myths: legends like the living undead, the Draugar, the destinations in the afterlife. I weave threads linking sagas to beliefs, eye witness reports to legends, covering Scandinavian, Northern Germanic and Anglo-Saxon Norse sources, amidst the backdrop of Viking and pre-Viking folk superstition. This book arises from much of the source material gathered over the years, part of my quest to write ‘The Lord Of The Rings in the real world’, to envisage and realize a hard-boiled world as anything from fantasy. The tales are many, and in many of the tales, if the dead were taken care of, they would in return protect the homestead and its people, as well as provide for its fertility. If not, they would return and take the bodies of the living as the living undead. 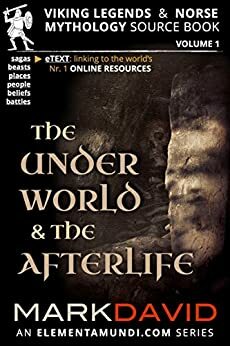 In this publication I look at these and many more aspects of the living, the dead, the underworld and the afterlife.